Posted on June 23, 2017 at 4:38 am. Could skill based gaming be the next big thing to hit the casinos of Macau? That’s exactly what developer and supplier of skill based gaming machines, GameCo, is hoping, as the brand announces it has been given the green light to operate in Macau by the end of 2017. 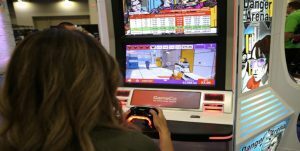 In May this year, GameCo exhibited two new games on its Video Game Gambling Machine (VGM) platform at the Global Gaming Expo (G2E) Asia casino industry trade show at the Venetian Macau. ‘Danger Arena’ is a first-person shooter style action game played with a built-in console, and ‘Pharaohs Secret Temple’ is a touch-screen puzzle game similar in style to popular social media game, Candy Crush. The skill based games aim to attract a younger generation of players to casinos, appealing to the millennial audience who have grown up with advanced video games like Grand Theft Auto and World of War Craft. It is exposure to these highly detailed, three-dimensional games that has left younger players adverse to the flat, one dimensional gaming features offered by traditional electronic poker machines. GameCo CEO Blaine Graboyes told GGRAsia, “We are currently working on an update of our game for the Macau 1.1 [electronic gaming machine technical] standards. The VGM model was first released by GameCo in three Caesars Entertainment Group casinos around Atlantic City at the end of 2016. The games were introduced on a trial basis before being withdrawn in May 2017, although a spokesperson for Caesars has since confirmed the company remains committed to adopting the skill based developments. GameCo’s skill based games have been approved by Gaming Laboratories International LLC’s GLI-11 casino gaming device standards, which will make entry into Macau’s casino market easier. Earlier this month, software developer Scientific Games Corp launched its first skill based slot machine based on the classic 1970s video arcade game, Space Invaders. The Space Invaders slot game allows players to control a laser canon, moving it across the screen to while shooting rapidly descending lines of aliens to collect credits, advance through higher levels and win multiple jackpots. Space Invaders is now available in New Jersey and will soon roll out to other land based casinos across the United States.